All transactions are safe and secure with a reliable history in online purchasing behind each of our associates. Buy the Superhero Cash t-shirt to own Johnny Cash clothing and merchandise. This Superhero Johnny Cash tee shirt features an image of the legendary American musician wearing a Batman t-shirt. The design is modeled after the comic book cover art. This T is perfect for a night spent fighting crime in Gotham or a quiet day at home huskin' corn as you listen to your Johnny Cash box set. This tee will look great with your favorite pair of black jeans and cape. 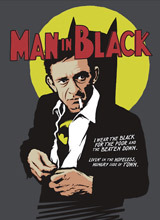 In addition to the Superhero Cash tee above, browse the Johnny Cash Clothing Gallery for more apparel like men's and women's clothes, kids shirts or hoodies.